Drinking plain water all the time is just like eating dal, chawal, roti, sabzi everyday. It is in no doubt healthy for your body, but you can make the task of hydrating yourself more interesting by sprucing it up with the flavor of various healthy ingredients. Sassy water is nothing but spruced up water named by Prevention magazine to pay tribute to its creator Cynthia Sass, who designed it for the "Flat Belly Diet". Apart from the benefit of having no calories it is a great drink to sip throughout the day since it aids weight loss apart from the ingredients which provide various other health benefits. 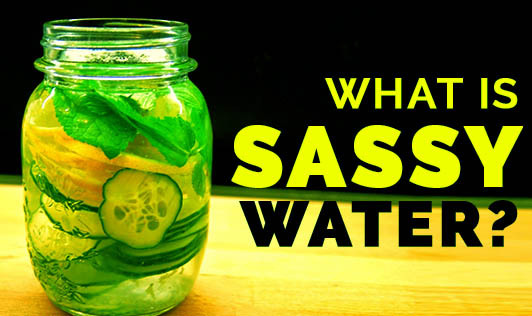 The recipe of sassy water includes ingredients such as ginger, cucumber, lemon, and mint. The ginger and mint acts as a boon for our digestive system and helps in treating nausea, gas, and diarrhea. The addition of lemon and cucumber makes it a good source of vitamin C and potassium. Combine all the ingredients in a jug/pitcher. Cover it and refrigerate overnight so that all the flavors get infused. Enjoy it through the day.